One more item crossed off the bucket list! I’m just back from a Sheila E. cruise — yup, that Sheila E., who was Prince’s drummer and Latina lover. The trip gave me the tropics and great music. Most importantly, it gave me a taste of diversity at sea. My daughter Gabi joined me for the first-ever “Sheila E. Glamorous Life Latin Cruise” (Feb. 10-12, 2017). We left out of Miami for a weekend in the Bahamas, joining 2,100 other guests of every imaginable race and culture. What a treat to watch Sheila E. on stage. At 59, the girl still looks great, wailing away on drums in stiletto heels. On the last night, she played “The Glamorous Life,” a hit single Prince wrote for her. I watched, getting emotional as I thought about the night I met Prince. Sheila E. is amazing off stage too. 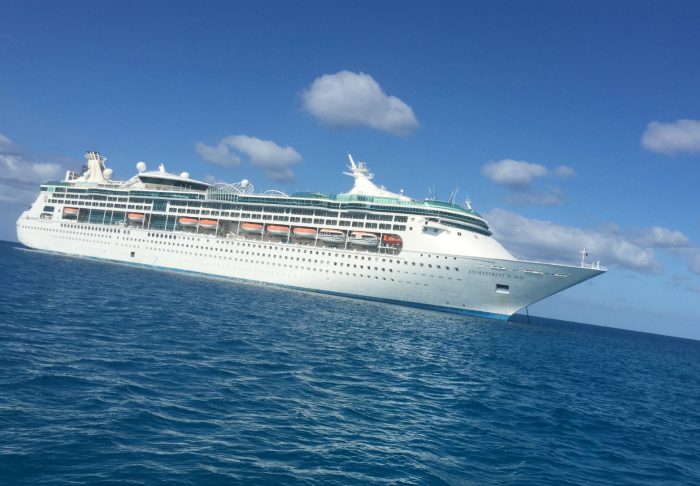 It took guts to charter a Royal Caribbean ship and customize her own program of (mostly) Latin music and performers. But Sheila E. is clearly made of tough stuff. At 5, a male cousin raped her. As she healed, drumming offered a comforting outlet for self-expression, according to her autobiography, The Beat of My Own Drum. By 14, she was playing in her dad’s band. Later, she performed with everyone from Marvin Gaye to Diana Ross. 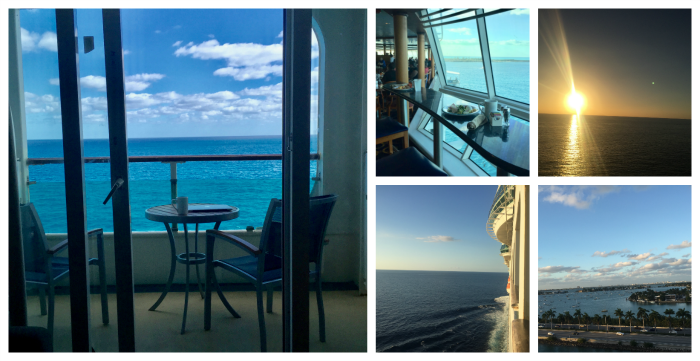 And on this cruise, she shared her family and her life with us. Why a Sheila E. cruise? Since Gabi was a little girl, she’s wanted to cruise. Since I was a little girl, I wanted to drum. So as adult mother and daughter, this $1,250-per-person mini-vacation spoke to childhood dreams. Our room came with a balcony that put the ocean at our door. The ship featured a gym, casino, spa, bar, cafe, formal dining rooms, and a big, all-you-can-eat buffet dining hall. We passed on both the chance to win a pre-owned Rolex and the spa talks about weight loss (haha). But with so much to explore, we regretted missing the drumming circle and some of the late-night music. On the Michael Jackson theme night, everyone dressed up in black and white. That evening — and on other nights too — we were treated to Judith Hill, who records as a solo artist and used to sing back-up for Michael Jackson. Tony Succar, a Miami-based composer, gave us a UNITY concert of Michael Jackson hits set to a Latin beat, which was pretty incredible. During a panel discussion, both Judith and Tony mentioned their moms, who are Japanese. Judith’s dad is black, while Tony’s dad is Lebanese, Spanish and Mexican. There were a few jokes about sushi and that hard-working Asian stereotype. But seriously, I left wondering how their Asian heritage might have added to their creativity. Viva, America! Sheila E.’s family is interesting too. Pete “Pops” Escovedo, who drummed for Carlos Santana and Count Basie, is Mexican and Indian. Her mom is African American and white. They raised their kids in Oakland, Calif., in a black neighborhood. During a panel discussion about their family and music, they had this advice for parents: Let your kids try different instruments. After all, Sheila E. played violin before embracing the drums. As for the cruise’s not-so-great moments: Comedian George Lopez cancelled at the last minute. Of our two stops, one was Nassau, which was fine. But the other was CocoCay, a Royal Caribbean-owned property that’s a fake island destination. Still, the beach was okay and we got more free food. What I enjoyed most: the Atlantic Ocean, the concerts, the food (big surprise), people watching, deck beach chairs, panel discussions with the musicians. What a fantastic feeling to be on the water. Until the cruise, those gorgeous, shifting shades of blue only existed for me on my artist paint palette. But now, I’ve got ultramarine, cobalt and pthalo blue inside of me. Like the music, it breathes and rocks on as part of my soul. Would I cruise again? You bet. You made some wonderful memories with this experience. I’ve been on 2 cruises in my life. One back in the 1980s with my mom to Bermuda – priceless! Another, about 5 years ago with my husband & daughter, for hubby’s family reunion – FUN! It’s great how you’re crossing things off of your bucket list. Hope you keep adding more items! 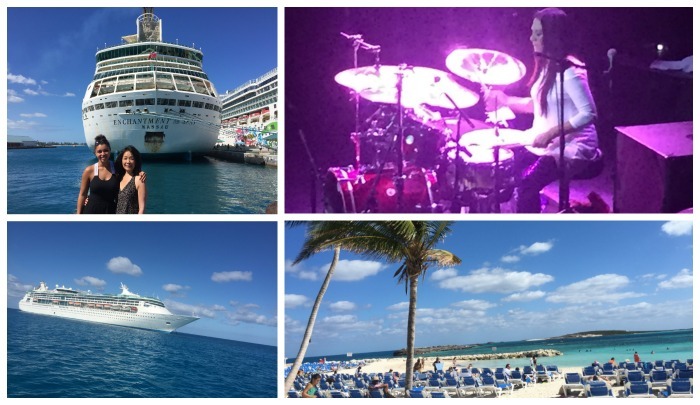 What a lovely vacation experience….and you saw Sheila E.! All my girls loved their time on cruises. Making memories is important! Oh, wow, Diane. So you’ve taken your kids on cruises? Is this like a thing that people really do? I guess Gabs and I might’ve really missed out when she was younger. Well, better late than never! What a fun and memorable cruise!!! Sheila E. rocked the boat!!! She was so friendly,humble and down to earth,stopping to take pictures,and sign autographs. I have to say I was really disappointed in George Lopez for cancelling out last minute.I had a great time.Thanks Sheila E.
Ahhhhhhhhh! This sounds wonderful! What an amazing experience! I’ve never went on a vacation cruise and never really desired to. Then again, I never heard of a cruise like this. This was a packed-with-percussion weekend and a nice slice of cultural diversity. And Sheila E?!!!! Enough said. You always wanted to play the drums? I always wanted to play the guitar! Instead, I had to take piano lessons. Having the opportunity to try several instruments was a great gift to Sheila E. from her parents. Who knows what one will do when given the freedom to explore and make your own choices? You may just grow up to be a world-star musician, play with the big boys and curate getaway escapes for all the colors of the world. 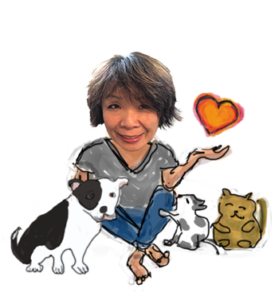 Skye, thanks for this comment. I think your mall image is spot on — everything is nice and clean and shiny and designed to please middle America. And yet, there’s a whole cruising world filled with variations — river vs. ocean, Europe vs. Caribbean or Alaska. Each cruise line has its own personality. At least, this is what I heard from fellow travelers. We heard about one that really interested us. Apparently, there’s a reggae music cruise. It stops in Jamaica. It’s supposed to be incredible. And the crowd is supposedly super-inclusive — every kind of color and culture. Might have to put this one on the list for next time. Thank you Betty for sharing your experience on the cruise. I had hoped to go but couldn’t, so appreciate the detailed review with photos. I love Tony S and Sheila E. My household is bicultural (Anglo/Latino) and I use French in my work. I too appreciate exploring different cultures. We are all stronger and more interesting when we embrace our differences. Peace from Toronto, Canada.